Today was a fight the entire country of Poland has been talking about for months. 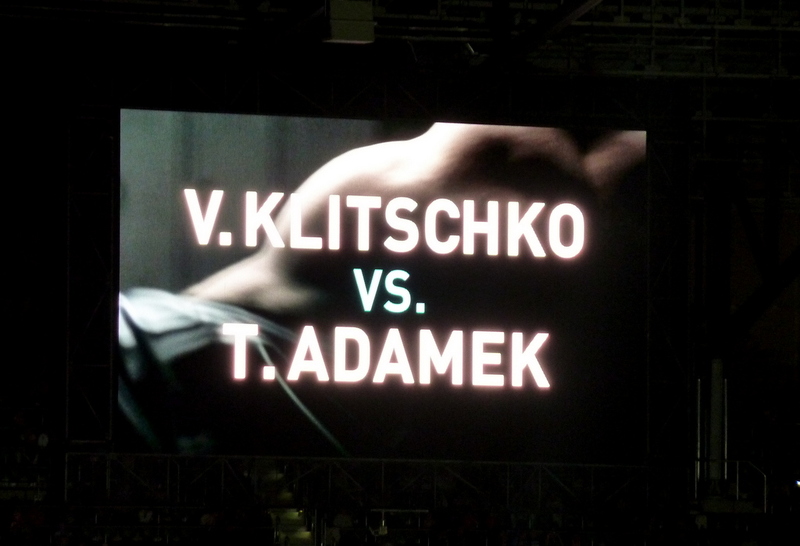 Tomasz Adamek, the Polish warrior, took on the heavy weight champion Vitali Klitschko. 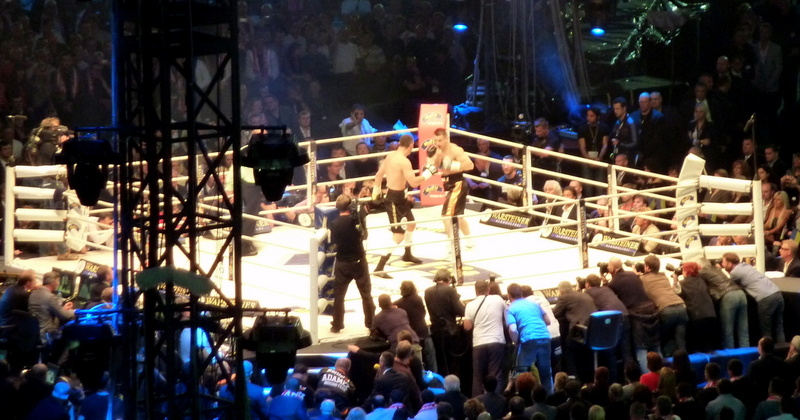 It was a double whammy for Wrocław; first off it was the very first heavy weight championship battle that took place in Poland, and second, it was the very first event that took place in Wrocław’s spankin’ new stadium built especially for next years UEFA Euro2012 football (soccer) championship. Wrocław’s new stadium is pretty awesome, this has to be said. It’s just what this city has been missing and I bow to all the great minds that made this happen…and built it only two tram stations away from my house, too. The stadium is pretty simple really, it’s solid concrete slab as far the eye can see and makes it a little boring to look at. 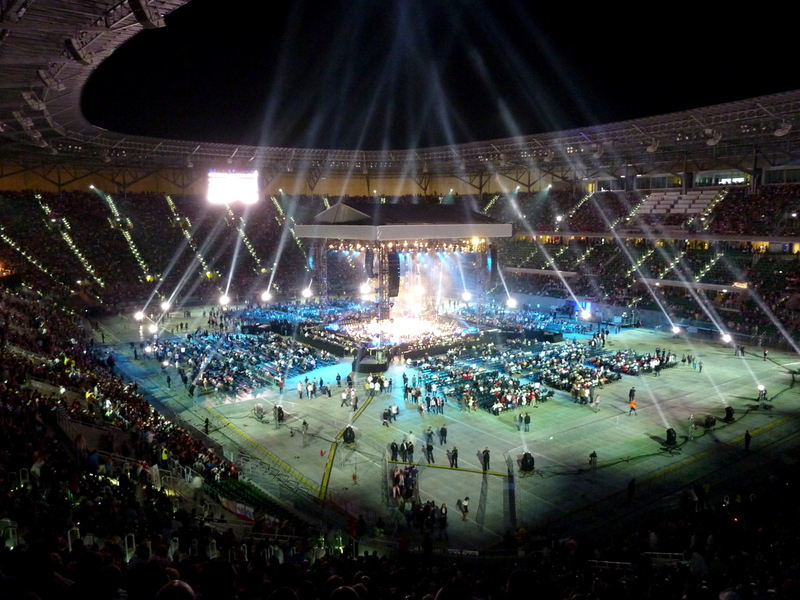 There aren’t any escalators or fancy design aspects in sight, its purpose was to sit as many people as possible and it servers that well with seating for 42,000 people. There really aren’t any bad seats in the house unless you happen to sit way above and behind one of two giant screens. We sat in a corner which would have been just perfect for a football game but was a little less than ideal for a boxing match that took place dead center of the field. And while the stadium was great, the area surrounding the stadium still needs a lot of work. 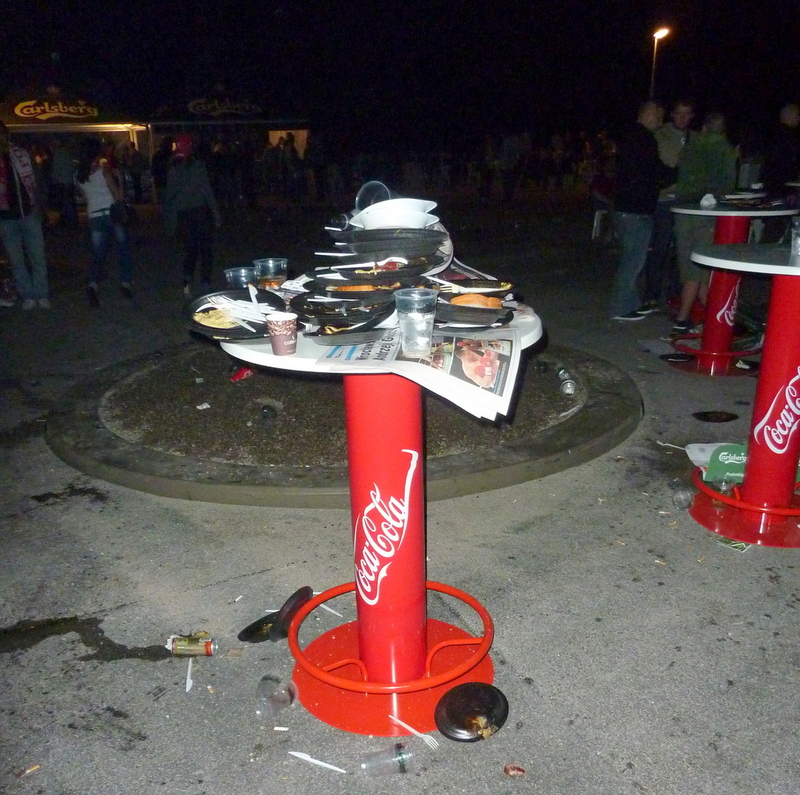 First of all, how about placing some freakin trash cans for those 42,000 people you just fed and sold beer to. Everything, and I literally mean everything, ended up on the floor. The food, albeit expensive, was tasty and very much eatable. Beer was sold in hectoliters and you needed to buy specials stadium chips to purchase anything at all at the concession stands. 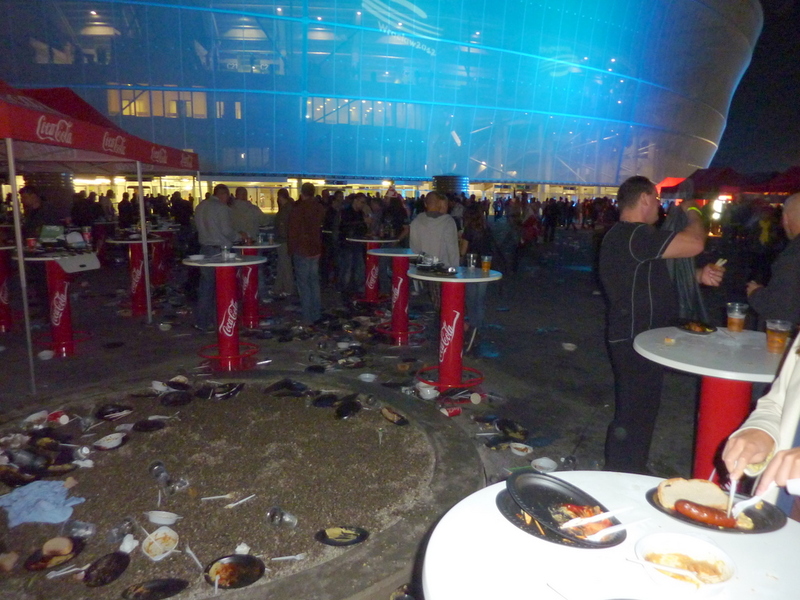 The entire experience before even entering the stadium felt like a giant mess, this has to be cleaned up one way or another. After the fight 42,000 people all took to the streets, luckily all streets in this area were closed off today just for the fight. 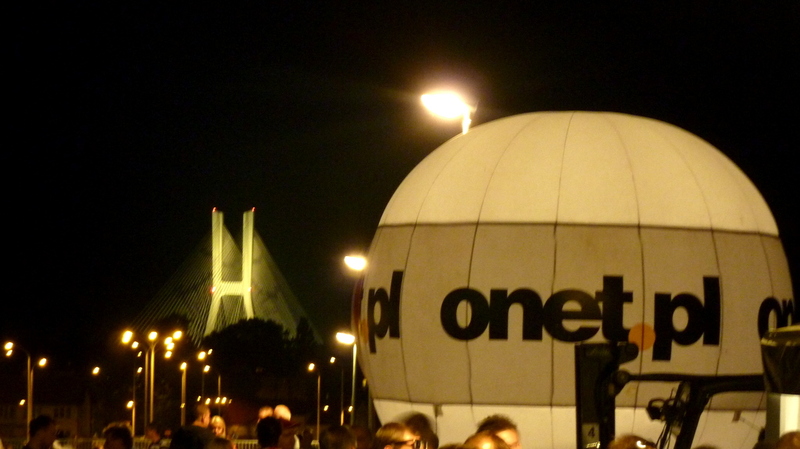 I’m really wondering how the city plans to disperse thousands of people leaving the stadium all at the same time, this was another giant mess and I’m happy that there were no incidents among the drunken crowd all walking in a claustrophobic uniform towards the nearest tram. Had there been an actual emergency, God help us all. 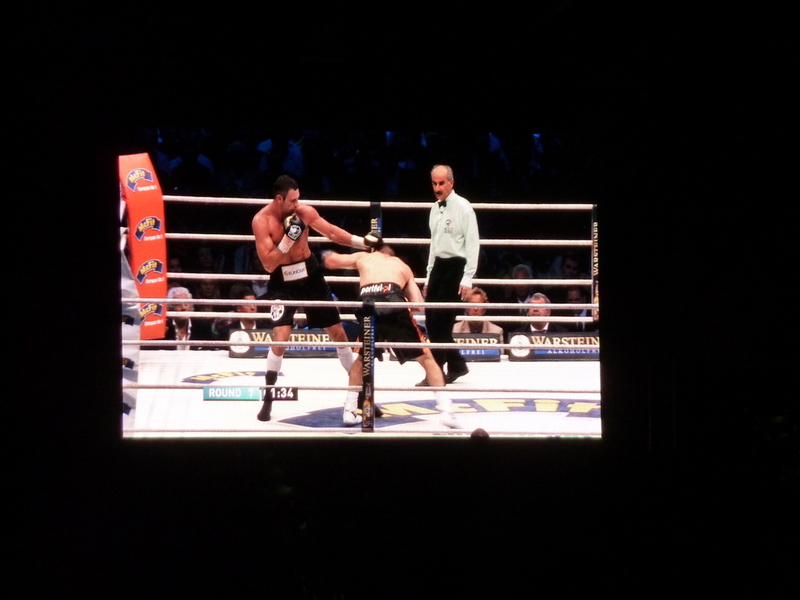 We watched four fights take place prior to the main event and even witnessed a technical knockout in favor of a lesser known Polish fighter. The crowd was testing the waters of noise pollution but didn’t really crank up till Adamek took to the stage, and Holy crap it got loud in there. We all sang along with the Polish national anthem and then clapped while the Ukranian anthem was played, this displayed more patience and respect than I personally thought would take place towards Klitschko. The fight started around 11pm and from the very beginning something was odd about a visibly smaller Adamek trying to beat the giant in the other corner. The crowd never let up, but we knew Adamek had a long fight ahead of him after first couple of rounds. His reach was just too small to sneak in a punch that would do any sort of damage. Every round Adamek seemed to be the faster fighter, but also seemed to be the one getting a bigger beating. This was confirmed to everyone when the score cards were read out loud during one of the brakes. It just wasn’t in the cards. 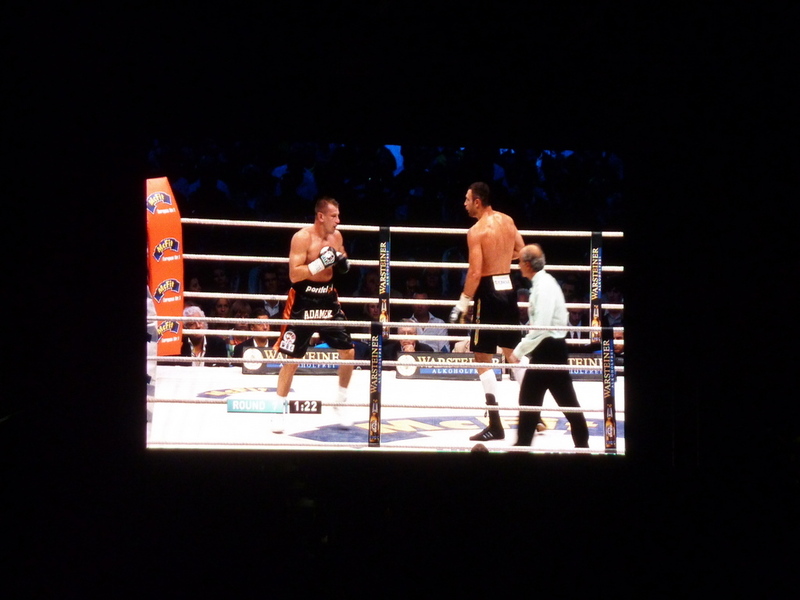 Adamek was taking a heavy punishment and the referee finally stopped the fight in the 10th round in favor of Vitali Klitschko. This was my first live fight and I congratulate Adamek for giving his all. The crowd loved every minute of it and even though Adamek lost the fight he left the ring a winner in many hearts; 42,000 of them to be exact.